Ellery Jones joined the Make-A-Wish Foundation of Mississippi as development director just in time for its 2017 annual “Evening of Wishes,” a gala featuring dinner and live and silent auctions. 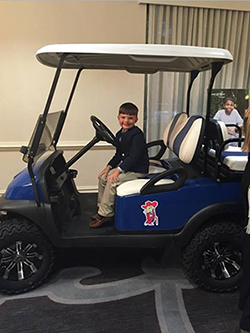 Five year old Blake, who had been battling Leukemia received his wish of a customized Ole Miss golf cart in event! Armed with a gala committee of 15 and her partnership with OneCause, Jones and the Make-A-Wish Foundation were able to plan the entire event using the OneCause event check list and making sure they were up to date on every facet of the gala, from registration all the way up to their silent and live auction and lastly checkout. “Since our auction items were not just event specific, we really appreciate that OneCause enables us to sell them at any time via our Giving Center event website,” Jones said. With the ability to open the auction whenever they pleased, Make-A-Wish was able to start taking bids and selling items before the gala even began. On May 6, 2017, Jones and her team headed into their event ready to make wishes happen. OneCause’s event managers were a big help as well. “We initially had a little hiccup with the event tent cards, there was a spelling error on them, but the event manager onsite fixed it quickly, and it was one less thing we had to worry about,” With a little over 100 packages and 5 live items, the 2017 Evening of Wishes went on without a hitch. “OneCause made the process streamlined and quick, which benefitted both our chapter and our guests,” said Jones, noting that one of the supporters commented that this was the most organized fundraiser she’d ever attended. 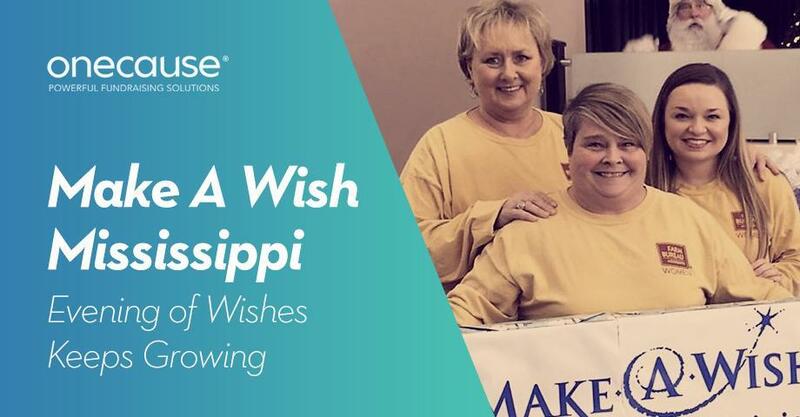 Since using OneCause, Make-A-Wish Foundation of Mississippi has been able to steadily increase the proceeds from its events. As recently as four years ago, proceeds were in the $100,000 range; they have now more than doubled their proceeds using mobile bidding technology. As for Jones? She’s ready to continue to make history with the Make-A-Wish Foundation. “Our goal for 2018, is going to be around $300,000,” and we can’t wait to make their wishes a reality.